Earlier this week I introduced you to our friends Donald and Daisy Mallard (click here if you missed that post). As promised, here are two more photos of the lovely couple during one of their exploratory waddles around our yard, and an update on their comings and goings. You’ll notice that Donald is vigilant, while Daisy’s focus in on the ground, searching out all potential edibles. I took the photos from inside the house, where I was cheering her on – the more slugs she swallows, the better our garden veggies will fare! Donald hasn’t been back since the day I took these photos. Daisy has come on her own a few times but her visits have been very brief – a fast trot and gobble, a very brief bath in the pond, a quick shake-off on the bank, then she’s flown off into the woods. What this means is that ducklings might be on the way again this year. 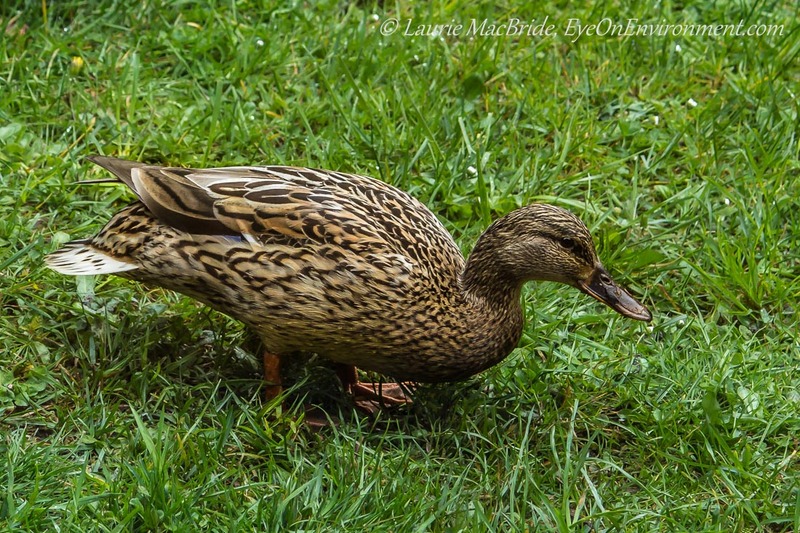 According to my bird reference books, during the time that female mallards incubate their eggs, the males gather elsewhere, to go through their annual molt. So Donald is perhaps at the big pond a quarter mile or so up the road, hanging out with the guys and looking a bit scruffy – while Daisy’s in a big hurry to get back to the nest, which is presumably somewhere in our woods. We’re keeping our fingers crossed and eyes peeled for some fluffy little bundles. UPDATE, April 29: The ducklings have arrived! No photo, alas, but we spotted half a dozen little fluffballs early this morning with Daisy, having a brief paddle about the pond before waddling off, back into the woods. If the experience of previous years holds true, we won’t see them again – one sighting only has been the rule each year. Nevertheless, we’re thrilled! In other (unrelated) news: I have a guest blog post & new photo on the Gabriolan.ca site. Please hop over and have a look – you’ll find it here. 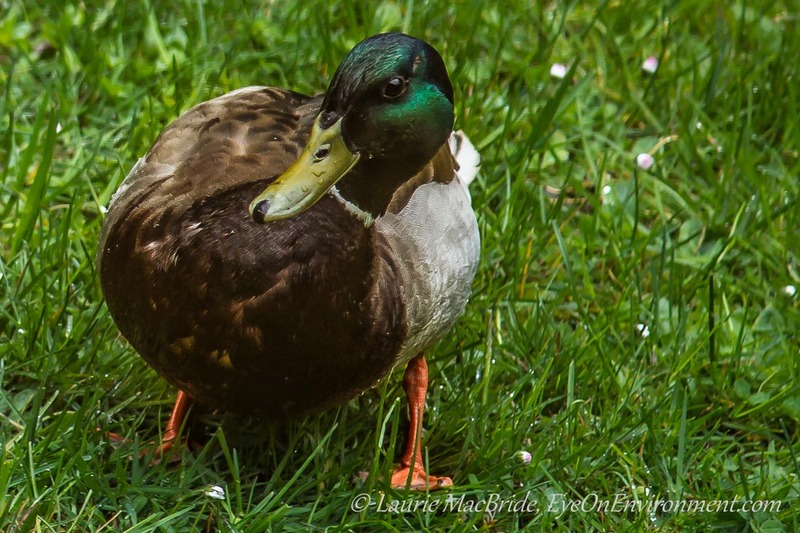 Posted by Laurie MacBride, Eye on Environment on April 25, 2013 in Animals & Wildlife, Birds, Garden and tagged animal behavior, ducks, gardening, mallards, nature, photos. Your Mallards look quite a bit different from Michigan’s. If you place this happy couple in our millpond, they would really stand out from the others. The patterns on the hen are different and the body of the drake looks rounder. Maybe it’s because they have so much vegetation in your wonderful region. Love the story! Thanks Doug! It’s been interesting seeing them each spring – at least we think it’s the same couple each year! I’m not sure what they find to eat in our pond…I do hope it’s not the frogs and newts…that they prefer a vegetarian diet! Ducklings! I guess that makes you grandparents…Congratulations! I also just read your piece in the Gabriolan. Nice! Hope the show went well. It went very well, thanks – good turn out, lots of lovely photos and very enthusiastic folks who came to see the show. Thanks for commenting Phil – and yes, they are! My 2 year old loved your pictures and now pretending he is a ducky and quacking! Thanks for the post. That’s hilarious! Glad to be of service, Deb, and thanks for commenting. Laurie, your posts are a welcome respite in a busy world. Thanks a bunch! Thanks & you’re welcome, Marie. Great to hear from you. Hope all is well with you – wherever you might be at present!